I want to welcome anyone that is visiting from Sew Mama Sew’s Giveaway Day! 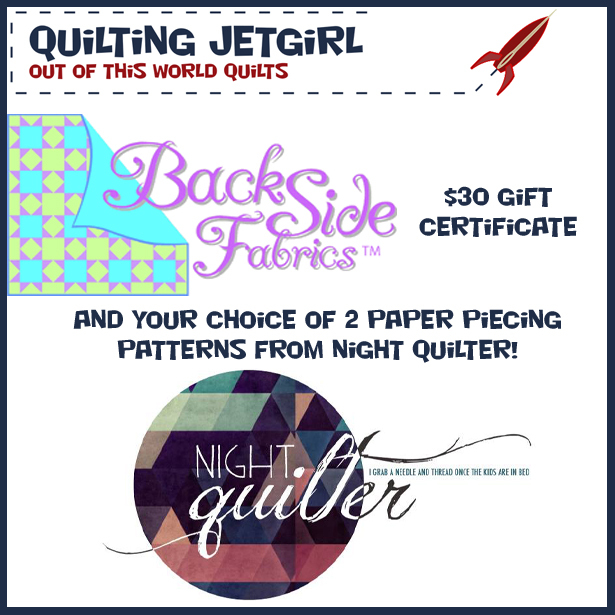 I am giving away a $30 gift certificate to BackSide Fabrics and 2 paper piecing patterns (of your choice) from Kitty @Night Quilter! I have made several larger quilts recently, and I have found the selecting of wide quilt backing fabrics at BackSide Fabrics to have just what I needed for each project. They also have great customer service and are quick to communicate should fabric be inadvertently out-of-stock, which I greatly appreciate! Christine Scholz is the owner of BackSide Fabrics, which is an internet only, family run business. They specialize in wide quilt backing fabrics that are both beautiful and affordable, and Quilters Dream Batting. BackSide Fabrics was born from Christine’s longarm machine quilting business, The Quilting Patch. The Quilting Patch opened for business in May of 2004 after the purchase of a Proto Stitch Wizard longarm quilting machine. Clients kept asking if I carried wide quilt backs, so the light bulb went on! After doing some research, I found that there was a need in the quilting community for an online store that specialized in a large selection of beautiful and affordable wide quilt backings. BackSide Fabrics opened for business in June 2007! I’m a stay at home mom of two littles, wife, sewist of quilts and other beautiful things, knitter, gardener, yogi, and all in all lover of life. With two little kids, my only sewing time is after bedtime. Thus the night quilter was born. Kitty has a fabulous eye for color and her photography of her work is stunning. 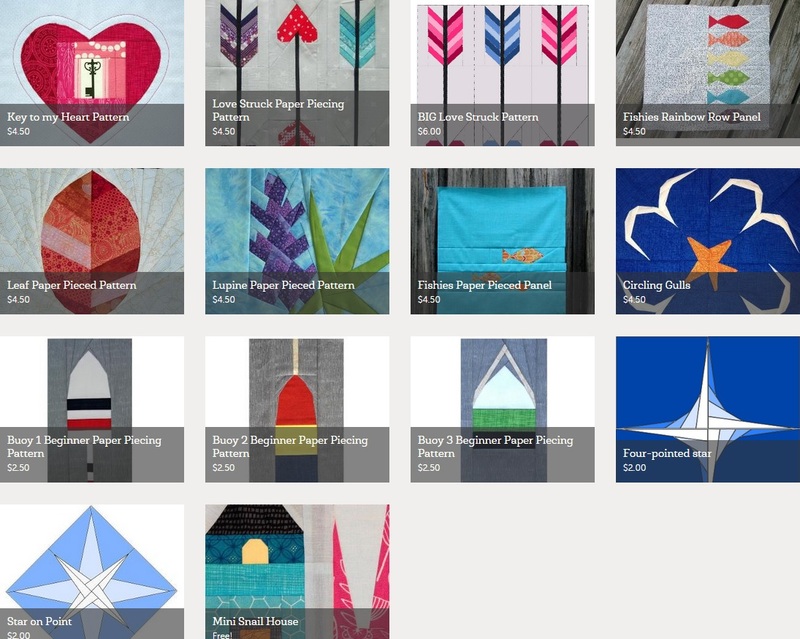 You can view Kitty’s selection of paper piecing patterns in her Craftsy store and in the image below. If you are new to my blog, I hope you take a minute to have a look around. I host a weekly link party called Quilty Thankful Thursday where we can share our gratitude for sewing wonders big and small, I have a series of philosophical discussions and posts, I have a selection of quilt patterns for sale, and I have been working to expand my series of tips and tutorials! Here is a quick mosaic of a few of the projects I have worked on recently. I am always interested in learning about new tools and techniques, so what is your favorite quilting / sewing tool? 203. My newest tool discovery that I’m quite fond of are the wonder clips. Not pricking my fingers every 6 inches when I’m working on binding is definitely a plus! Thanks for the chance to win. I really like your transparency Triangles quilt! 204. I keep up with your posts via Blogger. 205. I just starting using best press starch and it makes such a difference! 206. I follow you on Instagram and Facebook and using Bloglovin’! 207. My favorite quilting tool is my mother’s thimble! 209. I’m not usually one to swoon over single-purpose tools but I really do love my 6″ HST bloc-lock ruler! I use it all the time, for more than just HSTs. 210. I’ve been happily following your blog with a bookmark. Keep up the thoughtful posts; they are so refreshing! 211. At the moment my fave tool is the seam ripper 🙁 Actually I’ve been using my phone to audition fabrics for a quilt using the black and white mode – so handy for checking tonal variations. 213. I love jelly rolls, a nice fast way to make a quilt. 214. i believe in my seam ripper! 215. It’s not a tool, but my favorite recent discovery is fusible fleece. I like using it for wall hangings because it stays so flat. Thanks for the great giveaway! 216. I like you on Facebook. Thanks for all the inspiration! 221. I love a good thimble. Along the way I became a collector. 222. I love my thread holder thingy (I am SO technical!). I buy my thread on a cone (so much more cost effective) and the holder allows me to use it without messing up the tension as it feeds through my machine (seeing as the cone is too big to sit on the sewing machine’s thread holder). 223. I love my rotary cutter and rulers! 225. I am using an Eleanor Burns Flying geese ruler. It’s great! 226. Wonderclips – I always used the snap clips before, which are ok, but the Wonderclips are better. 227. Hi – I am following you on Facebook. 228. My newest favorite tool is a chopstick. I use it to move fabric through my machine. I use it to push out corners, etc. 231. Love my creative grids ruler – only have one but will get another – they don’t slip. 233. My most used and most necessary tools are my cutting mat and rotary cutter. I’d love to have a stiletto, that’s next on my shopping list. Thanks for the chance! 234. I’m a new follower on Bloglovin. 235. What would quilting be without the rotary cutter! 236. I learned to quilt with scissors so the rotary cutter is heaven. 237. Love my rotary cutter! 239. My favorite tool is my little pair of stork scissors. 241. I am rather old school – if I can’t get something to work right on the machine, I sew it by hand. And some things I’ve just never learned to do (like putting in an invisible zipper – which is the next step on my current project). 243. My favorite tools are not unique, but I couldn’t live without them! My scissors and a sweet handmade pincushion, a gift from grandmother. 244. Love the ease of the rotary cutter and mat and I was just introduced to the process of English Paper Piecing. 245. Receiving your posts via email! 246. My favorite tool has to be my awesome rotary cutter. It’s one with a snap back button push retractable blade (Havel’s) and it’s awesome! 247. I follow on Bloglovin’! 248. My favorite tool is a little 3.99 ironing board from Ikea. It’s the perfect size for quilt blocks and can easily be folded and put aside. Since I quilt on our kitchen table, it’s important to get everything out of the way before I start cooking or my beloved fabrics will be covered in tomato sauce. 249. I’ve added your blog to my Inoreader feed. 250. My favorite quilting tool is the rotary cutter. Thanks for the great giveaway! 251. My favorite tool is this super sharp seam ripper I found in an Amish-area quilt shop. It is fabulous!